Clinical research organizations must switch from paper-based to all-digital trials. The digital revolution is knocking at the doors of the clinical research industry, and CROs are increasingly, if reluctantly, letting it in. Although the biotech industry revels in the promise of wireless solutions, Internet applications, and genomic discoveries, CROs have largely shunned opportunities for technological improvements and remain insulated from such advances in other health sectors. As the dynamics preventing greater use of the technology and automation shift, the CRO industry stands on the threshold of rapid change. According to a 2001 report from Lehman Brothers, an investment banking firm that tracks the industry, CROs that successfully make the transition to e-pharma will represent "one of the most compelling sectors in healthcare over the next 24-26 months." This article examines the changing CRO industry; the growing interdependence among pharmaceutical companies, CROs and technology suppliers; and the impact of both on the drug development process. For many pharmaceutical companies, CROs are integral to the candidate pipeline and have significant influence on the cost and efficacy of new product launches. Industry observers estimate that CROs now service 20-25 percent of the sales and marketing budget. In fact, clinical development in Phases I-III now consumes 40 percent of the time and two-thirds of the cost of drug development. Pharma companies spent roughly $2.6 billion on CROs during 2000 for clinical trials alone and are expected to outsource even more clinical research as genomic discoveries dramatically expand the process of targeting new agents. The good news is that a KRM Group study of 2,800 Phase III trials revealed that CROs can conduct clinical trials on average 30 percent faster than pharmaceutical companies. The bad news, according to the Lehman report, is that although there is room for improvement, it will only happen when CROs restructure their operations, improve strategic relationships with pharma clients, and implement contemporary digital technologies. It seems clear that the industry will benefit from improvement in CRO performance. But improving that performance will ultimately require updating traditional and often obsolete research practices deeply rooted in the industry's culture. An unbelievable 95 percent of clinical trials are still paper-based, according to Charles Jaffe, MD, PhD, director of medial informatics for AstraZeneca. "The process seems anachronistic," he notes. "Statisticians are forced to wait until the paper results are manually entered before data analysis can proceed." In the past 20 years, the average number of patients per trial increased from 1,700 to more than 4,000. NDA filings have grown from 38,000 pages to 91,000. Total elapsed study time has increased from 11.6 years to nearly 15 years. The clinical trial portion of development expanded 50 percent, from 4.4 years to 6.7 years. How can the CRO industry, conservative in philosophy and business practice, undergo the transformation necessary to accommodate such a huge increase in potential business coming down the pipeline? Some insiders speculate that the CRO sector will undergo the same transformation as many before it-time management, office management, and financial planning- described by the "technology adoption life cycle" in Geoffrey Moore's book Inside the Tornado. The transformation begins with "technology enthusiasts," who form the basis for establishing the commercial viability of any breakthrough. Once the technology has gained a foothold among those pioneering customers, the more conservative buyers need to invest similarly to remain competitive in a new market that is moving toward a new standard. The "tornado" effect occurs when the technology, no longer an unproven or mysterious resource, finally is accepted by the market as the de facto standard, and the dynamics change dramatically to satisfy an emerging demand for the new product. CROs now operate within the "early market" for new research technology products. The e-clinical technology cycle may already be underway. Evidence of that can be seen in subtle shifts of power in the CRO market, where pharmaceutical companies, managed care organizations, and other perimeter players fused with the CRO industry through mergers and acquisitions. Earlier this year, Eli Lilly tapped a $50 mission fund to invest in a start-up company specializing in Internet based clinical trials. At the same time, several other pharma companies established venture capital funds to cultivate the growth of similar technologies. Also this year, managed care giant UnitedHealth Group purchased InSite Clinical Trials, and Omnicare Clinical Research acquired Ibah, a publicly traded CRO. Although such acquisitions will likely happen only when there is a compelling business reason for the company initiating it, those that do undertake strategic acquisitions will be better positioned to offer a broader range of clinical research alternatives to the pharmaceutical sector, and pharmaceutical executives may ultimately benefit from the wider range of services mad available to them. ability to cross-reference multiple studies with databases. With the potential upside to digital data capture, why aren't more CROs implementing the technology to support it? "Fear of the unknown," suggests Eric Wilke, MD, president of ClickFindMed. "Many CROs perceive new technology as unreliable, insecure, and subject to regulations they don't understand. Ironically, the technology can actually ensure compliance of data transfer regulations such HIPAA far more readily than paper-based methods and at a fraction of the cost. 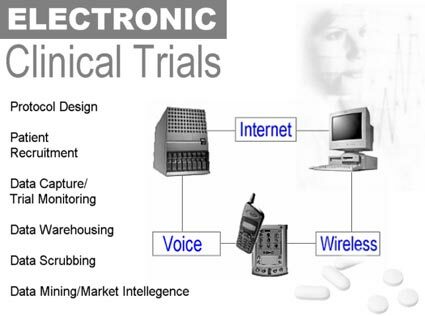 Clinical trials are also more secure and reliable when conducted on a real-time basis, made possible through Web, IVR [interactive voice recognition], and wireless technologies." But there are practical issues, as well. "To benefit from some of these transitional technologies, CROs would have had to implement them within hundreds of investigator sites and on very tight time frames to move the process along," notes Paul Bleicher, MD PhD, chairman and chief scientific officer of Phase Forward, widely recognized as one of the founders of the e-pharma movement. "The lead time to implement those systems interfered with the objective of the CRO to ensure a timely launch of new trials. With the availability of Web-based clinical trials, those difficulties are virtually eliminated." Bleicher also believes that pharmaceutical executives must collaborate closely with CROs and the technology partners to plan the introduction of new research technologies within the overall timeline for new clinical trials. A recent CenterWatch survey examining the relationship between cost and quality in CRO selection reveals another impediment to the new technology. The study found that pharma companies' main reason for selecting a CRO is not related to cost but to the ability to execute the program efficiently with quality personnel. At the end of the day, speed to market with quality data is the ultimate goal of any drug development effort. CROs may hesitate to embrace the new technology until pharma companies convince them that "low cost" and "high quality" in drug development need not be mutually exclusive. Expanded pharmaceutical research has caused R&D budgets to double in the past ten years with only marginal improvements in output. An April 2001 study released by Accenture, formerly Andersen Consulting, claimed that biotechnology research has not lived up to industry expectations. The study compared projections offered by more than 200 executives from 15 pharmaceutical and biotechnology companies for the future of drug development. In 1997, those executives predicted the number of new products in development would triple. Unfortunately, most of the technologies expected to accelerate the process have yet to be fully implemented. The report concludes that the industry now needs to increase the number of new targets by 50 percent if it wants to meet its published ten-year growth projections. Finding new targets will not be as challenging as processing them. The genomics movement should rapidly increase the volume of drug targets, and in fact, is already happening with very little work in the field. And it is likely that the proliferation of information will give rise to an exponential increase in possible targets-but with a lower return on investment from each study, simply because traditional clinical research technologies have done little to make the process of trial and error more cost effective. Therefore, although the genomics movement offers great promise, it will also provide the industry with even greater R&D costs and decreased new-product yields during the next several years. The gap between perception and reality in drug development has given rise to a new industry: the technology service supplier. data mining through relational database applications. "New technology suppliers give the big pharma companies and CROs the opportunity to test new approaches to drug discovery," notes Barry Grayson, director, office of grants and contracts for Pfizer. "But those who focus on their entire value proposition around one element of the process will have a difficult time surviving unless they partner directly with a traditional CRO." Grayson notes that the CRO market is still dominated by a handful of multinational companies-Quintiles, Parexel Kendle, Covance, PPD, and AAI- and that Big Pharma not only has more confidence in larger firms, it often sees them as the only viable option for conducting multinational clinical trials. "The industry faces a catch 22," Grayson says. "On one hand, the smaller CROs and start-ups offer great technology but cannot take it to market because they cannot access a multinational population. The larger CROs may not have an incentive to implement advanced technology because they control access to those populations." Evidence that the industry is beginning to seek advanced technology can be seen in the greater number of requests for electronic data collection and processing in requests for proposals (RFPs), says Bleicher. "In the end, however, we must follow the lead of the economic buyers, the pharmaceutical companies." According to the Lehman Brothers' report, pharmaceutical companies and CROs must spend $70-$130 million each to fully implement the technologies available to support effective and efficient clinical trials. Although that my be beyond the means of all but the top-tier firms, the emergence of e-pharma suppliers ensures an economical alternative for companies attempting to implement change incrementally. Indeed, there may never be a better time for CROs and pharma companies to begin the crucial transformation that will stimulate interest and investment in new technologies. Recent financial disclosures reflect an improvement in CRO financial performance because of improving RFP volumes and declining cancellation rates. By collaborating on the technology and timetables associated with clinical trials, CRO and pharmaceutical executives can finally begin to realize the potential from the digital age that they expected to see long ago. Ian R. Lazarus, FACHE, is managing partner of Creato (www.creato.com), a biotechnology business development firm and a member of the editorial board of Managed Healthcare Executive, PE's sister publication.